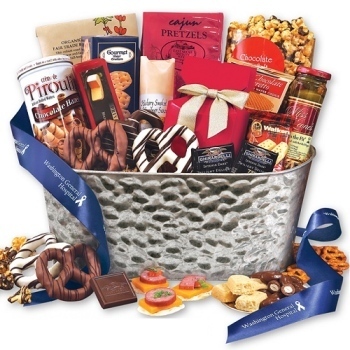 Your business customers and employees will be delighted to receive these delicious corporate gift baskets or food gift towers. Choose from our Maple Ridge Farms collection where each gift is made fresh when you order it! Maple Ridge Farms offers your logo or message imprint on ribbon, with a low set up fee. 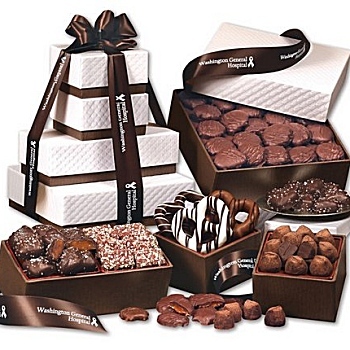 Your recipient will also enjoy any one of our many fresh baked, gourmet cookie gift towers or candy and nut gift towers. Minimums do apply. Have a lot of gifts that need to be delivered? Delegate the job to us! 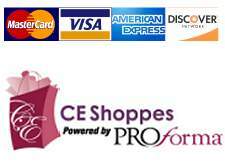 We are specialists at individually drop shipping your orders. We will provide you with an easy to use excel spreadsheet to fill in your addresses and away they go! You can even order weeks ahead of time and we will make sure they arrive on time. Personalize your gifts by adding an optional gift card.